I PICKED UP a really good tip on the banks of the Little Manistee River in Michigan the other day from Jon Steffensen, who is an outstanding dry fly fisherman. At this time of year the Little Manistee, like many rivers in this part of the country (heck, in most parts of the country now, given widespread drought conditions) runs low and clear, which is a good news-bad news deal. Good because it’s “Summertime” and the wadin’ is easy. (You can start humming now that I put that song in your head). Bad because the fish are beyond spooky. Getting into position to make a dry fly presentation, especially when you’re climbing over logjams and ducking overhanging branches, can border on impossible. Jon’s answer is simple in a slap-your-forehead kind of way. When you watch a trout rise, or when you see a juicy run upstream where you might reasonably expect a fish to live, you don’t march a straight line toward the target. You want to be a wake-free wader, and that means traversing the current as you move against it. A little zig-zag thinking can work wonders. That often means backing off, walking the wide route, taking your time and setting up slowly. Simple tip, I know. But be honest: how often do you pound a straight line from point A to point B when you fish in low water? I do it all the time. Target acquired… I’m on it… thud, thud, splash, splash… cast (a perfect presentation! ), but no love. And we wonder what happened. You can goof up more casting scenarios with your feet than you ever will with a wild loop of a fly line slung overhead. But most of us never think about that. That’s a universal fly fishing truth, from any trout river to any bonefish flat. Naturally, I tried to conjure up a jazz music analogy (because I’m always thinking about this column, wherever I fish). And what I came up with is also kind of simple-stupid, but the best lessons in anything are fundamental. A straight line from middle “C” to the “C” an octave higher is called a scale. And scales are important for teaching basic skills. But scales aren’t music. At least not performance music. And they’re certainly not jazz music. You might want to start on a “C” and end on a “C” with the rest of the band 16 measures down the tune, but it’s all those other side-stepping, off-the-path notes that you play that make things interesting and add effect. Am I suggesting that anglers should start running serpentine “S” courses up the river as they fish? Of course not. Leave the giant slalom moves on the ski mountain. And you probably want to pay attention to that deep hole upstream, regardless of what the trout or the music in your head might be telling you to do. But I am telling you that I’ve spent many hours wearing a mask and a scuba tank in rivers watching trout behave. And I know that no-no number one is making shadows over the run where the fish are (with your body, with false casts, whatever). No-no number two? Noise. Grinding gravel with your boots is a big mistake. Splashing and pushing wakes as you wade is also an angling faux pas. Minimize your wake to earn a take. You can learn the hard way, or you can trust me on that. If you put a little jazz in your step as you wade the river—and jazz is all about discovering the virtues of the tangential, and respecting that loud is not necessarily better when it comes to playing for effect—you will catch more trout when the waters beg stealth. 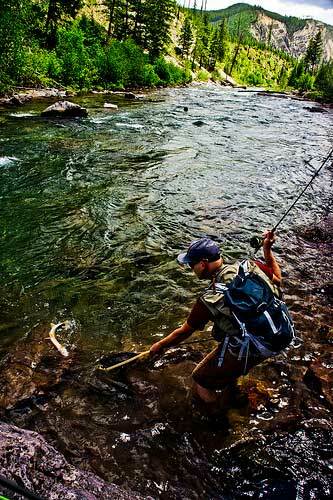 Every great cast in a trout river starts with what you do with your feet. What you do with your hands and arms should be a secondary consideration. Always.